Moorebank Logistics Park will deliver over $11 billion in economic benefits over 30 years through improved productivity, reduced business costs, reduced growth in congestion and a better environment. The precinct provides a significant boost to national productivity as more containers can be unpacked on site, which reduces costs for business and consumers. The includes $120 million a year for the economy of south-western Sydney. MIC's current capital expenditure estimates (both value and timing). Moorebank Logistics Park will create about 1,300 jobs during construction and 6,800 operating jobs at the terminal. Development of the terminal will also create jobs beyond the precinct boundaries in a broad range of industries that service the terminal and its staff. These industries range from construction suppliers to retail, financial services, food outlets and health services. Moorebank Intermodal Company engaged Deloitte to assess the potential employment opportunities that the terminal will bring to the region (both locally and more broadly). Employment opportunities, August 2016: This report estimates the job types and employment numbers on site once Moorebank Logistics Park is fully operational. As many as 6,800 new jobs are expected to be created across warehousing, transport, terminal operations, site management and ancillary services. Economic and employment impacts, April 2017: This report assesses the broader economic and employment impacts (direct and flow-on) of the terminal including the productivity benefits associated with the project for the regions surrounding the precinct over 20-year horizon. The report includes modelling of job numbers generated in various industries. The size of the site enables the layout of the terminal to be arranged to contain noise. the rail terminals will be located at the centre of the site and will be surrounded by warehousing that will provide a noise buffer. There will also be protection of approximately 115 hectares of biodiversity offset areas immediately surrounding the terminal. This land is preserved in perpetuity for conservation purposes. Once each terminal is operating, SIMTA will implement the open access regimes for the IMEX and interstate terminals. The open access regime will ensure that the terminal's at Moorebank are open access facilities that provide non-discriminatory access for rail and road operators that wish to use the terminals. MIC's role in open access is to ensure that SIMTA and its terminal operator complies with the open access regime and the open access reporting and compliance regime for the IMEX and interstate terminals. 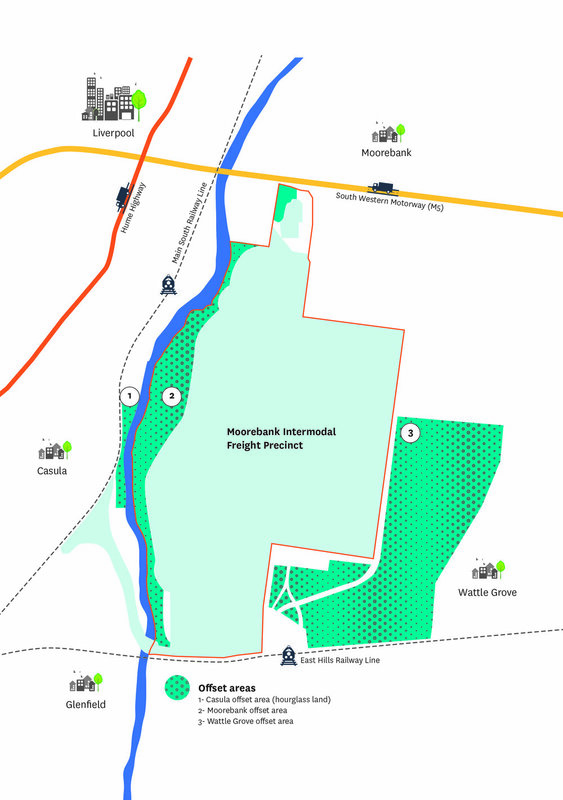 In addition to the significant opportunities for transport service providers, Moorebank Logistics Park will also provide a range of new opportunities for local businesses. To cater for the thousands of new employees and visitors, the precinct will include a range of amenities. All enquiries regarding the provision of services during the construction phase should be directed to SIMTA. All enquiries regarding the prospective tenant operations should be directed to Moorebank Logistics Park.